Reading and share top 10 famous quotes and sayings about Friars by famous authors and people. Browse top 10 famous quotes and sayings about Friars by most favorite authors. 1. "I shall see you on Blackfriars Bridge, Tessa." 2. "No, the last thing she cared about was whether people were staring at the boy and girl kissing by the river, as London, it's cities and towers and churches and bridges and streets, circled all about them like the memory of a dream. And if the Thames that ran beside them, sure and silver in the afternoon light, recalled a night long ago when the moon shone as brightly as a shilling on this same boy and girl, or if the stones of Blackfriars knew the tread of their feet and thought to themselves: At last, the wheel comes to a full circle, they kept their silence." 3. "On that same tour we ran into a band at Aylesbury Friars, a biggish venue in Oxfordshire, England. They were a four-piece from Ireland called U2. They seemed like nice fellows and they sounded pretty good, but we didn't keep in touch. They're probably taxi drivers and accountants by now." 4. 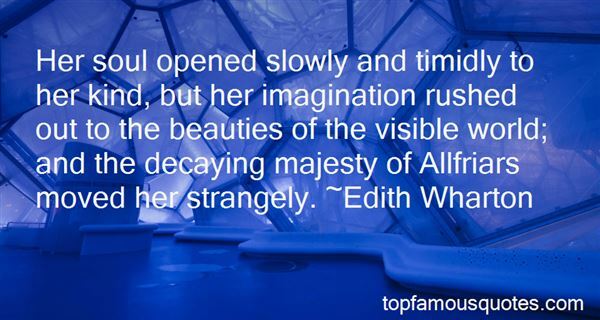 "Her soul opened slowly and timidly to her kind, but her imagination rushed out to the beauties of the visible world; and the decaying majesty of Allfriars moved her strangely." 5. "Last night he kept the vigil alone. He lay awake, wishing Liz back; waiting for her to come and lie beside him. It's true he is at Esher with the cardinal, not at home at the Austin Friars. But, he thought, she'll know how to find me. 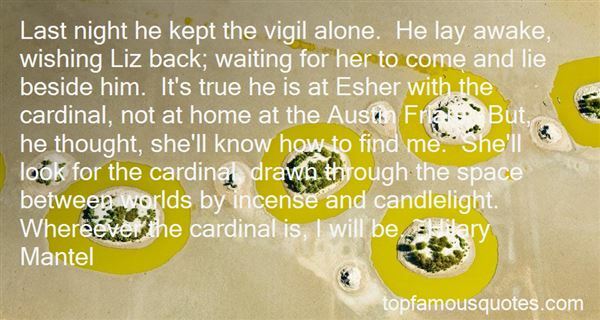 She'll look for the cardinal, drawn through the space between worlds by incense and candlelight. Whereever the cardinal is, I will be." 6. "You cling so tightly to your purity, my lad! How terrified you are of sullying your hands. Well, go ahead then, stay pure! What good will it do, and why even bother coming here among us? Purity is a concept of fakirs and friars. But you, the intellectuals, the bourgeois anarchists, you invoke purity as your rationalization for doing nothing. Do nothing, don't move, wrap your arms tight around your body, put on your gloves. As for myself, my handsare dirty. I have plunged my arms up to the elbows in excrement and blood. And what else should one do? Do you suppose that it is possible to governinnocently?" 7. "Despair makes priests and friars." 8. "All of that is true,' responded Don Quixote, ‘but we cannot all be friars, and God brings His children to heaven by many paths: chivalry is a religion, and there are sainted knights in Glory. 'Yes,' responded Sancho, ‘but I've heard that there are more friars in heaven than knights errant. 'That is true,' responded Don Quixote, ‘because the number of religious is greater than the number of knights. 'There are many who are errant,' said Sancho.Many,' responded Don Quixote, ‘but few who deserve to be called knights." 9. "I thought about evolutionary historians who argued that walking was a central part of what it meant to be human. Our two-legged motion was what first differentiated us from the apes. It freed our hands for tools and carried us onthe long marches out of Africa. As a species, we colonized the world on foot. Most of human history was created through contacts conducted at walking pace, even when some rode horses. I thought of the pilgrimages to Compostela in Spain; to Mecca; to the source of the Ganges; and of wandering dervishes, sadhus; and friars who approached God on foot. The Buddha meditated by walking and Wordsworth composed sonnets while striding beside the lakes.Bruce Chatwin concluded from all this that we would think and live better and be closer to our purpose as humans if we moved continually on foot across the surface of the earth. I was not sure I was living or thinking any better." 10. "The Memorabilia, the abbey's small patrimony of knowledge out of the past, had been walled up in underground vaults to protect the priceless writings from both nomads and soidisant crusaders of the schismatic Orders, founded to fight the hordes, but turned to random pillaging and sectarian strife. 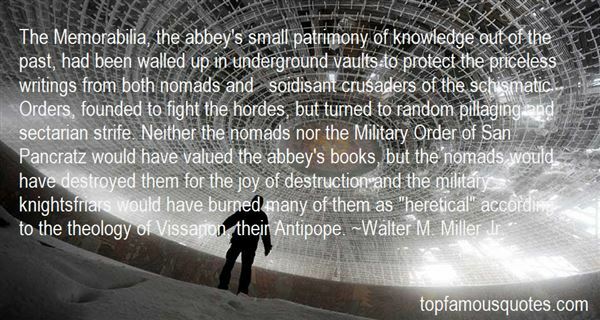 Neither the nomads nor the Military Order of San Pancratz would have valued the abbey's books, but the nomads would have destroyed them for the joy of destruction and the military knightsfriars would have burned many of them as "heretical" according to the theology of Vissarion, their Antipope." I will see you in another life when we are both cats."